Have you think that playing card has made from wood and designed in giant size? It would be some interesting and different. Here come, the playing card made from best quality of Teak wood that carved by talented craftsman from Java island. This playing card designed in giant size to make it perfect use for house decoration. The special appearance of this giant card is its motive. Polished in marble looks, make this card more elegant and beautiful. Its marble design also looks different with perfect suit colors. 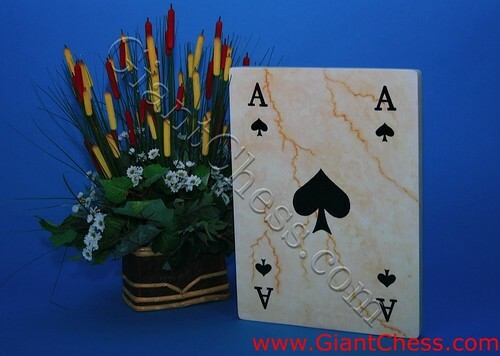 Adopted from famous card game combine with marble motive, this giant card decoration is perfect for decorate your house, school, office or even hotel. You can lay it at your living room, dinning room, family room, garden, backyard, patio area and other corner in your house. Just try it!